🌲 We plant a tree on behalf of every customer that leaves a review! 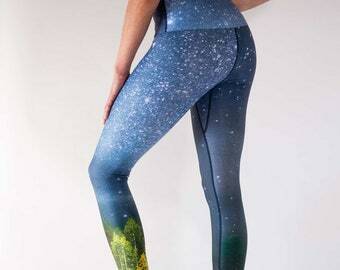 This leggings are amazing! They are gorgeous and so comfy at the same time. I' ve worn them for yoga a few times now and they let you move very easily in them. You can tell they are of a very good quality. Plus, the owner didn't ship them in a plastic bag, which I think is a very nice gesture. All in all, I am very happy with the purchase. Awesome pants! They are very stretchy but fit perfectly. Very high quality and beautiful design! We care about every detail: Care labels and hang tags are made of recycled polyester and recycled paper. Textilfab uses climate friendly hydropower and attaches importance to environmentally friendly processes. Inkeri Glova is the founder, designer and creative mind behind Arctic Flamingo. Arctic Flamingo has its roots in Finland but is currently based in Munich, Germany. Reusing existing nylon makes a huge difference to its environmental impact, reducing the amount that goes to landfill. Hello! I´m the founder, designer and creative mind behind Arctic Flamingo. After practising yoga for several years, curiosity and the need for my own unique leggings got me thinking about how to create leggings myself. Many attempts and failures later, the leggings left the sewing table in my living room and made their way into the wide world. Originally from Finland, it was only natural that I should seek inspiration in the nature of the Arctic: in Finland, people traditionally have a close relationship with nature. These Nordic roots represent stillness, harmony, stability and being at one with nature. 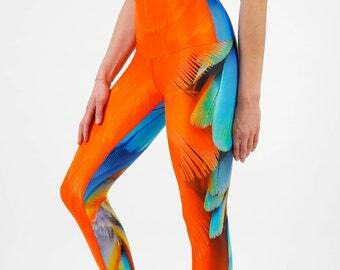 Arctic Flamingo combines them with bold, colourful tropical birds that embody freedom and a lust for life. For me, these two polar opposites tell a story about two complementary pairs in the same way as sky and earth, cold and warmth, being grounded and uplifted. As a mother of two small children, it should be no surprise that I think about the legacy that we will leave for future generations. For me, it was never just about creating beautiful and unique leggings but also about having a positive impact on the world and society: paying attention to how the product is made, where it is made, what it is made of, and by whom. Looking at the bigger picture, I think being environmentally friendly means being aware and asking questions – before you can care about something, you need to know about it. 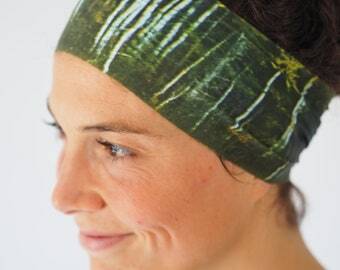 I see my brand as a megaphone for like-minded yogis and yoginis around the world, empowering them to spread the message of conscious living and sustainable choices. People who want to support local leaders and politicians that share their passion. Arctic Flamingo is for people who care enough to see that caring isn’t enough – people who want to put words into action. 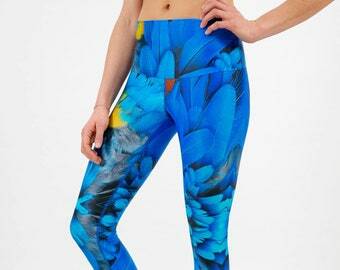 With my yoga leggings I want to raise awareness and increase support and demand for more eco-friendly businesses. I challenge you to think about the impact your actions and buying decisions have on the environment. I want you to carry a message of eco-consciousness wherever you go. Wearing Arctic Flamingo leggings is a statement: a way of empowering yourself and others to care about the world. Mrs. Stieglitz does the cutting and sewing for a part of my leggings. She is very experienced and has the machinery for manufacturing sports clothing. 1.2 The controller in charge for data processing on this website within the meaning of the General Data Protection Regulation (GDPR) is Inkeri Glova, Arctic Flamingo, Siegrunestr. 10, 80639 München, Deutschland, Tel. : 015738467670, E-Mail: inkeri@arctic-flamingo.com. The controller in charge of the processing of personal data is the natural or legal person who alone or jointly with others determines the purposes and means of the processing of personal data. 1.1 These Terms and Conditions of the company Inkeri Glova (hereinafter referred to as "Seller”) shall apply to all contracts a consumer or a trader (hereinafter referred to as "Client") concludes with the Seller related to the seller's goods and/or services presented by the Seller on the electronic platform Etsy (hereinafter referred to as "Etsy”). The inclusion of the Client's own conditions is herewith objected to, unless other terms have been stipulated. 1.2 A consumer pursuant to these Terms and Conditions is any natural person concluding a legal transaction for a purpose attributed neither to a mainly commercial nor a self-employed occupational activity. A trader pursuant to these Terms and Conditions is any natural or legal person or company with legal personality acting in the performance of a commercial or self-employed occupational activity when concluding a legal transaction. 2.1 When placing an item on the electronic platform Etsy , the Seller shall make a binding offer to the interested party for the sale of this item. 2.2 The Client can accept the Seller’s offer via the Etsy online order form. In doing so, the Client has to place the selected item in the virtual Etsy shopping basket and subsequently he has to go through the ordering steps specified by Etsy. By clicking on the button finalizing the order process, the Client declares the acceptance of the offer, whereby a contract comes into effect regarding the item previously selected by the Client. 2.3 The contract's content will be stored by the Seller and will be sent to the Client in writing including these Terms and Conditions and Client Information in text form (for example via e-mail, fax or letter) after conclusion of the contract. In addition, the contract's content will be stored by Etsy and can be called free of charge by the Client via his Etsy password-protected customer account. 2.4 The Client can correct all the data entered via the technical means provided by Etsy prior to submitting his order. Corrections can be made directly in the respective input fields of the online shop via the usual keyboard and mouse function. 2.5 The German and the English language are exclusively available for the conclusion of the contract. 4.1 The prices indicated by the Seller are final prices and include the legal value added tax. Any additional delivery and shipping costs are indicated in each respective product description if applicable. 4.2 For deliveries outside of the European Union additional costs may arise for which the Seller cannot be held responsible and which have to be borne by the Client. Such costs include fees for the transfer of funds by credit institutes (for example transaction fees, exchange fees) or customs duties or taxes. Such costs regarding transfer of funds may also arise, if delivery does not occur outside a country of the European Union while the Client pays from a country outside of the European Union. 4.3 Various modes of payment are available for the Client which are indicated in the Etsy Seller's online shop. 4.4 The seller allows payment via the payment method Etsy Payments. The customer can use the payment methods offered to him within the scope of Etsy Payments for payment. 4.5 If payment in advance is agreed, payment is due immediately after conclusion of the contract. 4.6 When selecting the payment method "PayPal", payment will be made via the payment service provider PayPal (Europe) S.a. r.l. et Cie, S.C.A., 22-24 Boulevard Royal, L-2449 Luxembourg in accordance with the PayPal conditions of use which can be viewed at https://www.paypal.com/de/webapps/mpp/ua/useragreement-full. 5.1 Should the assigned transport company return the goods to the Seller, because delivery to the Client was not possible, the Client bears the costs for the unsuccessful dispatch. This shall not apply if the delivery cannot be made due to circumstances beyond the Client's control or if he has been temporarily impeded to receive the offered service, unless the Seller has notified the Client for a reasonable time in advance about the service. 5.2 Should the Client collect the goods himself, the Seller informs the Client via e-mail, that the goods are ready for collection. After receipt of the e-mail the Client may collect the goods at the Seller’s place of business after consultation with the Seller. In this case no shipping costs will be charged. To exercise the right to cancel, you must inform us (Inkeri Glova, Arctic Flamingo, Siegrunestr. 10, 80639 München, Deutschland, Tel. : 015738467670, E-Mail: inkeri@arctic-flamingo.com) of your decision to cancel this contract by a clear statement (e.g. a letter sent by post, fax or e-mail). You may use the attached model cancellation form, but it is not obligatory. How long does it take to get my leggings? Orders ship within 1-3 business days of when your order was placed. For anything in stock, we ship via Deutsche Post (German post office) regular mail. • Within Germany: once your leggings have shipped, transit time is 1-3 business days. • Rest of the world: once items have shipped, transit time can range anywhere from 1-6 weeks depending on the country. Leggings are on the small side so if you are between two sizes, we recommend going for the larger size. However, keep in mind that Arctic Flamingo leggings are meant to fit snugly at first wear and our fabric will quickly shape to you and relax by up to half a size. We pay special attention to the hip measurement in the chart as we find it is the best indicator of fit. Please check the size chart (last product image) carefully and feel free to e-mail me with questions regarding sizing. Choose an environmentally friendly detergent and go easy on it! Wash cold, hang dry and don't use fabric softener because it reduces the fabric’s wicking capabilities (and is not good for environment). Do not tumble dry. The fabric is printed, cut and sewn in Germany. It is made in Italy.